Despite promising soon after becoming president in January 2009 that he would shut down Guantanamo Bay within a year because it was a “blot” on America’s reputation, Barack Obama has not done so. This exposes his hypocrisy. President Barack Obama did not leave his hypocrisy at home when he embarked on a 10-day African “safari” at the end of June. Visiting Robben Island where Nelson Mandela, the South African anti-apartheid struggler spent 18 years of his 27-year prison term, Obama stood in front of the tiny cell measuring 8x8 feet. Mandela had spent nearly 23 hours per day in that tiny cell. Obama said he had brought his daughters — Sasha and Malia — to see the prison and to be as “humbled” as himself by Mandela’s vigil for freedom. He lamented Mandela’s mistreatment at being imprisoned in a tiny cell and declared the anti-apartheid icon as his “hero.” Moving words indeed. Obama need not have traveled thousands of miles away to Robben Island off the coast of Cape Town to be “humbled” and to witness man’s inhumanity to man; he could have taken a short plane ride to Guantanamo Bay (aka Gitmo) just off the coast of Florida where his own government has held hundreds of prisoners in similarly horrible conditions for more than a decade. The cells at the US-run prison camp on the illegally occupied Cuban Island measure no larger than the cell in which Mandela spent nearly two decades of solitary confinement. Without in any way belittling the suffering inflicted on Mandela by the apartheid regime of South Africa, the fact is he was put on trial, albeit in a kangaroo court where his “guilt” was already pre-determined. Those held at Gitmo have not had the benefit of even a kangaroo trial (the military tribunals at Gitmo are designed to ensure automatic conviction but the overwhelming majority of those held there have not been put through any such process!). Since it was opened in early 2002, 779 prisoners have been recycled through the torture chamber as if they were animals herded into a pen before being sent for slaughter. An estimated 500 have been released because even the thugs could not concoct any allegations against them. They had nothing to do with the nonsensical allegation of involvement in “terrorism”. The US — and the West in general — has a strange definition of terrorism: those that oppose US aggression against their country are branded as terrorists. Far from giving compensation for the wrongful arrest and detention of the 500 or so prisoners — hostages would be a more apt description — released so far, another 86 of the 166 still held at Gitmo have also been cleared for release but they continue to languish in the torture chamber. Since not one prisoner/hostage has been convicted of any wrongdoing even in the kangaroo military tribunal, America is rightly viewed as a global outlaw. So frustrated are the prisoners at the continued illegal detention, mistreatment and humiliation that some 130 have gone on an indefinite hunger strike. 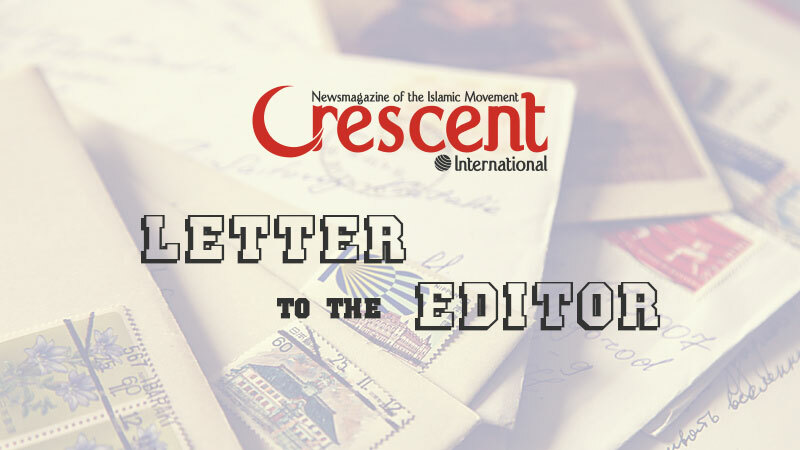 Their bodies were already caged behind iron bars or barbed wire; even their minds were being imprisoned when copies of the noble Qur’an were desecrated and/or taken away. The world has largely forgotten these hostages to American hubris but they decided to take a moral stand. They went on a collective hunger strike refusing to take any solid food. On August 1 (after Crescent press time), they would complete 175 days of hunger strike — nearly half a year. Their condition has deteriorated so much that they are being forced-fed by a tube inserted through the nose. This is an extremely painful procedure and each time the tube is inserted into a prisoner’s nose there is the risk of injury. American prison guards are not the most sophisticated people in the world; crudity is their trademark and they often rupture prisoners’ feeding pipe causing bleeding and intense pain. The guards take sadistic pleasure in causing pain to those under their control. During his first presidential campaign, Obama had pledged to shut down Gitmo. A day after he was sworn in as president in January 2009, Obama signed executive order #13493 pledging to close Guantanamo Bay within a year. More than 55 months have passed since that executive order was signed yet the prison camp remains fully operational. Far from closing it, Obama authorized an infrastructure upgrade and also signed the National Defenc Authorization Act (NDAA) in December 2011 that prevents the transfer of innocent prisoners to their homeland or even the US mainland. Periodically, Obama has made soothing noises about the hostage camp and how it is damaging America’s “reputation”: what reputation, one wonders. “Guantanamo has become a symbol around the world for an America that flouts the rule of law,” Obama said on May 23 during a speech at the American Military College in Washington, DC. He said, for the umpteenth time, he would like to close it, yet since January of 2013, there was no envoy appointed to oversee its closure. On July 1 Clifford Sloan took up his assignment as the newly appointed Gitmo closure envoy. The appointment and reopening of the office is the only concrete step Obama has taken concerning Guantanamo since his May counter-terrorism speech. If Obama wants, he can take steps to release the 86 prisoners who have already been cleared. There is a simple procedure that Congress has put in place. The Secretary of Defense must confirm that the risk of detainees returning to militancy is low and that the transfer is in the interest of national security. He must then give Congress 30 days’ notice to release the men. So far, Obama has refused to exercise his executive authority taking refuge behind the excuse that Congress has tried to block his path by passing an amendment to the NDAA on June 14 that prohibits using Defense Department funds to transfer detainees to Yemen for one year. While the amendment was passed by 236 to 188, it is not law because the Senate has not passed it yet. In fact, the Senate is trying to facilitate release of the cleared prisoners as well as close the torture chamber altogether. 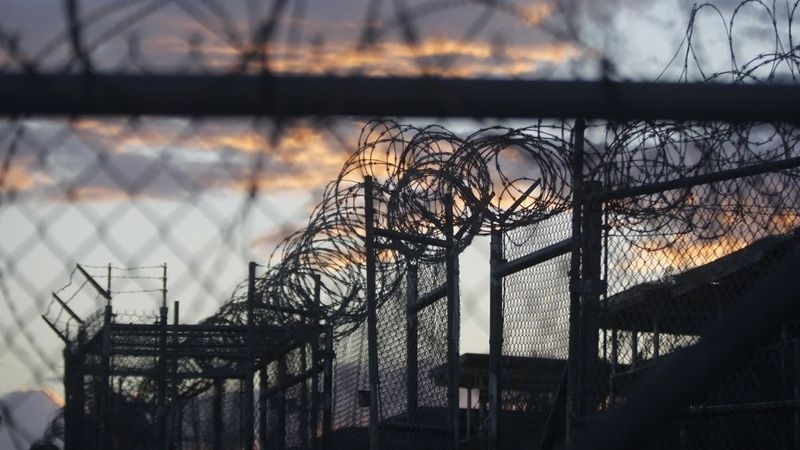 The Senate Armed Services Committee passed a bill on June 13, a day before Congress’s NDAA amendment that would allow the Pentagon to send detainees to the US for medical treatment, sustained detention, and prosecution. Democratic Senator Carl Levin inserted the provisions into the Senate version of the 2014 NDAA, and the Senate would be voting on it in the fall. 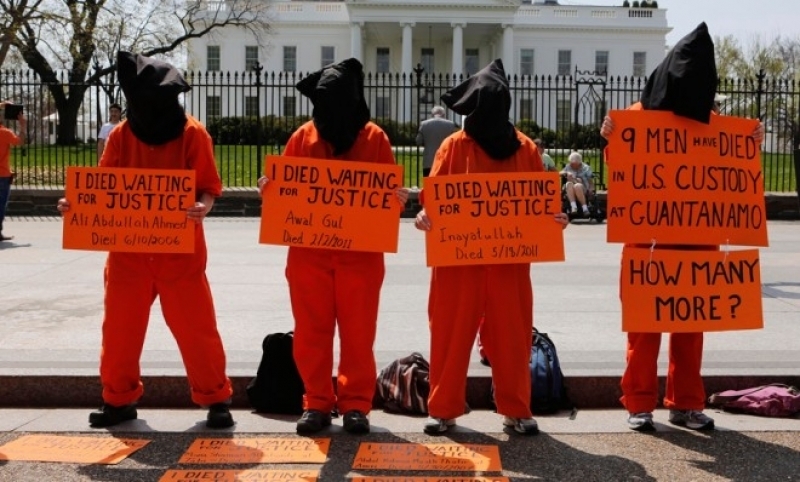 Civil society groups in the US have launched their own campaigns for the release of prisoners/hostages and the closure of Gitmo. Activists have gathered more than 400,000 signatures on a petition to be handed to Obama urging him to show leadership. Even Lt. Colonel Morris Davis, a former Chief Prosecutor at Guantanamo, has signed the petition. Vigils are being held in towns and cities across the US drawing attention to the barbaric practice of holding detainees without charge or trial. 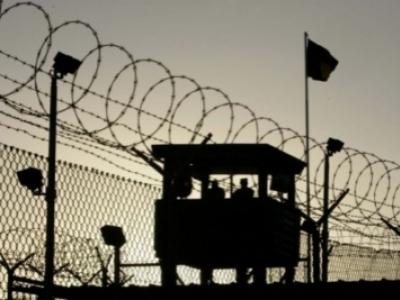 A novel approach adopted by some Americans that have a conscience is to go into an open-ended hunger strike in solidarity with the Gitmo prisoners. The American hunger strikers include several military veterans, some of whom have also joined anti-war groups and are campaigning for an end to US militarism and injustices worldwide. In one of the dramatic actions at the White House on June 26, Diane Wilson, 57 days into her hunger strike by then, jumped over the White House fence. Twenty-two others, all dressed in orange jumpsuits, were also arrested by refusing to leave the White House fence. While the corporate media did not pay much attention to their action apart from condemning them for “violating” White House territory, the social media was abuzz with their bold move. The prisoners/hostages, meanwhile stripped of their freedom have sought novel ways to maintain their dignity and to continue to resist their tormentors in whatever way possible. One is to always call the adhan — the Muslim call to prayer — to proclaim the greatness of Allah (swt), for each salah. While they may not be able to offer congregational prayer because they are kept in solitary confinement, even the steel cages cannot silence their voices.